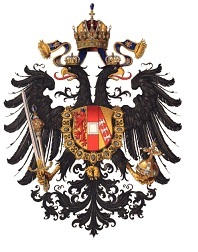 The Austrian Empire was founded on a remnant of the Holy Roman Empire. Napoleon I of France had attacked and then crushed the thousand-year-old Holy Roman Empire in 1804. Following the defeat of Napoleon I, a new empire was founded by the Hapsburg monarch, former Holy Roman Emperor Francis II, who became Emperor Francis I of Austria. The new empire was composed of his personal lands, within and outside of the boundaries of the former Holy Roman Empire. When Francis II assumed the title of the first Emperor of Austria, the empire stretched from lower Poland in the North to the Balkans and Northern Italy in the South, and from Russia in the East to Bavaria and Switzerland in the West. It would remain the largest and most powerful European empire, until early in the 20th Century. The multi-national population of the Empire included Germans, Czechs, Poles, Romanians, Hungarians, Italians, Ukrainians, Croats, Slovaks, Serbs, Slovenes and numerous smaller nationalities. The Empire, in this form, lasted from 1804 to 1867. The Empire of Austria-Hungary, which lasted from 1867 to 1918, was a monarchical union with the independence-minded Kingdom of Hungary. The union was the result of the Compromise of 1867, under which the Austrian House of Hapsburg agreed to share power with a separate Hungarian government, dividing the territory of the former empire between them. The Kingdom of Hungary then had their own parliament and internal self-government, but their sovereign continued to be the Austrian emperor. This union was expressed on official documents as K.U.K. or Kaiserlich und Königlich, meaning Imperial and Royal. This indicated that the Hapsburg monarch, Emperor Franz Josef I at the time, reigned simultaneously as the Emperor of Austria and as the King of Hungary. The Austro-Hungarian Empire was dissolved by the Treaty of Versailles, after the end of World War I, and all of its possessions were broken up into independent states, along ethnic and cultural lines. Unfortunately, this nation-making process made a political and geographical mess out of Eastern Europe, and the fallout would continue through the end of the 20th Century. The scan at the top of this page is the Austrian Imperial Coat of Arms. 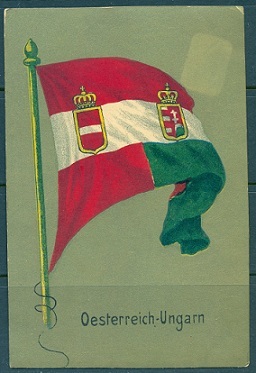 The scan at upper right is an early 20th Century postcard, showing the flag of the Austro-Hungarian Empire. 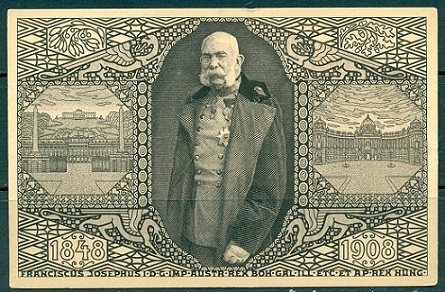 Links to content pages for stamps of the Austrian Empire appear in the right-hand column of this page.